I haven't had a catch up on new releases for a while so here's some new songs and some that aren't so new that I've just caught up with. First up is a new track from The Verlaines, one of the bands to define the Dunedin Sound. The Verlaines released a number of classic recording between 1981 and 1996, the best known being 'Death and The Maiden' (check the video on the video page). The thing that made The Verlaines so good was that songwriter Graeme Downes had a background in classical music and brought his knowledge of composition into a rock format, resulting in sophisticated and innovative song structures. Downes has since gone on to run the School of Contemporary Music at Otago University. In 2007 the band returned with a well regarded album Pot Boiler. 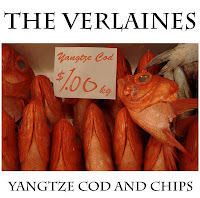 Now Downes has released 'Yangtze Cod and Chips', a taster for forthcoming album Corporate Moronic. As you can tell from the title this is a politically motivated album, Graeme has got fire in his belly. 'Yangtze Cod and Chips' addresses his anger about the free trade agreement signed between China and New Zealand. I recommend checking out a great National Radio interview (stream) where Downes explains his approach to the new L.P., and another National Radio feature on the Contemporary Music Degree (stream). 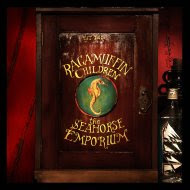 Christchurch duo Ragamuffin Children have long been a Counting The Beat favourite. Their 2007 debut album Werecat Lullabies earned them a Counting The Beat Alternatui for best female artist. They have just released a second album, The Seahorse Emporium. This time the sound has been fleshed out with a stellar cast of supporting musicians including Lee Prebble (who also engineered the album) and Jess Chambers. The result is an album of gentle acoustic indie folk that reveals more with each listen. 'Tincan' is one of the more immediately captivating songs on the album but the whole album is a rewarding listen and a step up from their debut. The Mots self-titled album has been described as a power pop gem. This talented band is made up of brothers Jol, Eden and Will Mulholland along with Greg Hillier. They have a strong pedigree with various members having been part of two great bands, Motocade and Gasoline Cowboy. On the album there is classic power pop, Strokes-like indie, songs dusted with a touch of light country, and playful rock a-la Hunky Dory era Bowie. I hope this self released album doesn't get stuck in the underground, it's accessible, full of great songs and a lot of fun. Finally, you've probably heard some of the debate around the controversial changes proposed in New Zealand's copyright law. It's not a clear cut issue, with artist's rights and natural justice in the balance (for a great backgrounder on the proposed changes check out this interview from Waiheke Radio). At the forefront of the campaign against the most controversial aspects, section 92A, is the Creative Freedom Foundation. As part of the campaign they have commissioned a song from Disasteradio. The song has been released under a Creative Commons Attribution-Share Alike 3.0 New Zealand License, which means that it is free to download, share, copy, distribute, sell, remix, and sample. You can find out how to participate in the project here. It's a complicated issue but the copyright changes in the form proposed would put things like the Counting The Beat podcast under threat, and I hope I'm managing to do more good for NZ music than harm.